In an age of increasing airline expenses, it is getting harder and harder to get a quality snack or libation for free on board a plane. Heck, Allegiant Air charges for water. One of the benefits of having Delta Medallion status (at least Gold and higher) is receiving “Have One On Us Coupons” as part of my elite membership packet. I have only used half of mine this year, so I suppose I should make it a point to use them before they expire! American Airlines provides similar recognition for the elite members. While excluded from Gold and Platinum members, Executive Platinum members are entitled (using the flight manifest) to receive a free snack and beverage on board when schlepping it in coach. For some time, Delta has been in the practice of including additional “Have One On Us” vouchers to elites checking in online, who have not yet been upgraded on at least one of their flight segments. There is some variation in how the system works, (this is Delta, afterall) but in order to receive the voucher, you may need to check-in using their phone app first, before checking in again online. Anyway, in the unfortunate event I had not been upgraded at all, I never had a problem getting it to show up on my boarding pass when printing it out online. I almost, expected it would become a standard benefit. However, there are new reports out that it is not working every time now. I searched but I could find nothing directly from Delta that could confirm this, but it seems the online check-in system did not operate as they intended, and receipt of these vouchers will be much more random now. Judging from one comment on the thread, and from my own observations, Delta may be cracking down on abuse of this in order to save themselves some money. The Terms and Conditions have been updated to now state “Duplicated or altered coupons will not be accepted. 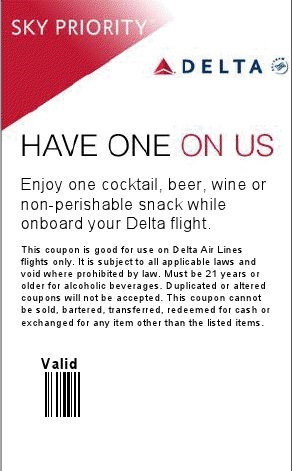 This coupon cannot be sold, bartered, transferred, redeemed for cash or exchanged for any items other than the listed items.” The word “transferred” has recently been added, implying this practice occurred far too often that Delta would have liked. HAVE PASSENGERS TAKEN THIS TOO FAR? Back in June, (when a delay caused me to get an instant upgrade on a later flight) I was sitting at the gate area before my first flight, and overheard a mother of 2 gripe about purchasing food. Realizing my posh surroundings in First Class would render my voucher unnecessary; I decided to do them a favor by offering them my voucher, suggesting they use it for snacks. I guess that makes me a felon in the eyes of Delta. 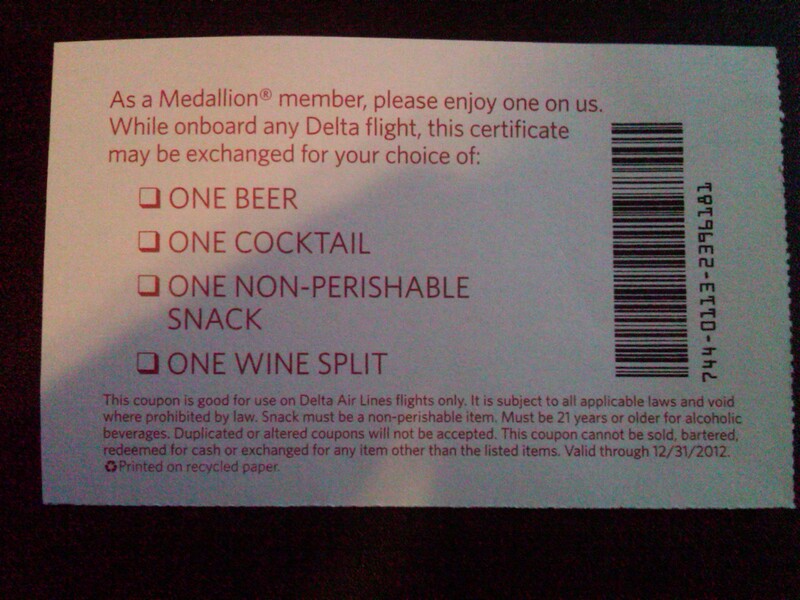 While these vouchers—whether as part of Delta’s elite member packet, or for online check-in, do specifically state they are for non-perishable items only. While not all flight attendants are willing to make this exception, I have found some flight attendants may quite be willing to allow these vouchers be exchanged for perishable items on their EATS menu. So, if you find yourself at a loss of free snack/drink coupons, you are in luck because there are some alternatives. Obviously, you can apply the $200 annual credit from the American Express Platinum card to receive free drinks/snackboxes, etc. In addition, as Money and Map points out, it is possible to receive “Have One On Us” vouchers using SkyBonus points. The SkyBonus program is the corporate version of the Delta SkyMiles program, and even if you don’t have your own company per se, you can still sign up. And if you use the promo code SB2012NEW, you can receive 25,000 Bonus Points, 10,000 of which you can redeem for 10 beverage coupons. So even if you are not currently frazzled by Delta’s lack of coupons for online check-ins, this is still relevant to navigating the path to better air travel.